UNITED NATIONS, January 5, updated -- With the Gaza Strip cut in two, and U.S. Ambassador Zalmay Khalilzad meeting with Arab League ministers in New York, the UN's John Ging told the Press on Monday, "We were all caught off guard by this operation." Ging was in fact on leave, the UN word for vacation, when the Israeli air strikes began. He finally returned to Gaza City on January 5, after being held up at the crossing along with a group of Red Cross surgeons. Inner City Press asked Ging, what did the UN anticipate or plan for when Hamas called of its unilateral ceasefire? We believed that this would not happen, Ging said. Video here, from Minute 36:35. Ging added that it is the conventional wisdom of senior political figures that there will be no solution of the Israeli - Palestinian conflict by military means. That's not the same thing as not planning for for the eventuality of military action. One wonders what the UN's or UNRWA's contingency plans were, and where those plans and planners are now. Inner City Press asked UN humanitarian coordinator John Holmes about the danger of the sewage lake by Beit Lahiya getting hit or targeted by Israeli bombs. Video here, from Minute 32:33. Holmes rushed to point out that "it is not so much that it would be targeted but if hit by accident" the wall would send a flood of sewage onto the population. And would the UN then say, "we were caught off guard"? On Sunday evening, Ban Ki-moon's spokesperson's office sent out three Press releases: the first on elections in Ghana, the second about Gaza, with the Ghana in the headline. One recipient mused, had Israel invaded Ghana? Then came the correction. In the basement of the UN, the Arab League ministers' meeting was postponed from 10 am to 11 am, then to 12:30. As the clock passed 5:30, a procession of Permanent Five Ambassadors went in to Conference Room 5: France's Jean-Maurice Ripert, who told the Press he didn't want to comment while his President Nicolas Sarkozy is in the region, US Ambassador Khalilzad, a delegation of Russians and then John Sawers of the UK. Egypt's Ambassador criticized Sawers on Saturday for his allegation of arms smuggling from Egypt into Gaza. It was a question to be asked. Update of 6:10 pm -- UK Amb. Sawers came out, made a brief statement at the stakeout microphone, then turned away. He stopped to churn out a few more pearls of wisdom, then headed up the stairs. His spokesman promised to return with an answer to the question, did Egypt complain? And lo and behold, he did, reporting that as of Monday morning, no letter or "demarche" had been received by the UK mission, but that the two Ambassadors have been repeatedly in touch, and are -- in Inner City Press' phrase -- still on speaking terms. And there you have it. Update of 7:53 pm -- while the Arab League ministers continue to meet in Conference Room 5, with non-permanent Security Council members, the UN has decided to terminate UN Television coverage, taking down not only the camera and speakers, but also the lights and UN logo background screen. Only after the U.S. and Japan speakers had finished did the cost savings begin. At the UN it's pay to play, even in the basement theater. Update of 8:10 pm -- in a final lull, Inner City Press asked how owns the blue UN backdrop. UN TV, the answer came. But UNTV staffers are "affiliates," not UN employees. So is the backdrop with the UN logo owned by an outside contractor? 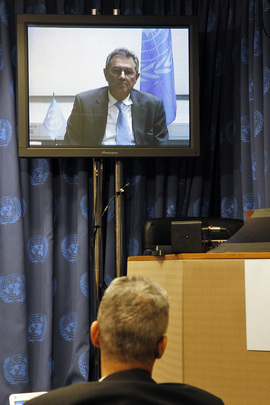 No, it was reiterates, UN TV is part of the UN, only its employees aren't. But where did the backdrop go? Update of 8:20 pm -- When the meeting broke up, what interviews there were, in the half-light, were entirely in Arabic. Inner City Press ran after the Egyptian Ambassador to ask if he had spoken with the UK counterpart, and what was said. Yes, he answered, we spoke, and the UK withdrew its accusation, and said there is smuggling from everywhere. And then he was gone. The Arab Group moves in world parallel to others, often by their choice, but this time at least in part by UN (TV's) choice.